Developing countries have been able to access climate finance directly from the international Adaptation Fund – rather than applying through intermediary, regional institutions – when their national institutions have met the high accreditation standards required to handle the funds. These national bodies are known as National Implementing Entities (NIEs). Jamaica and Senegal were among the first countries to secure accreditation for NIEs. In this CDKN ‘Inside story on climate compatible development’, Will Bugler of Acclimatise and Benoît Rivard of LTS International assess Jamaica’s and Senegal’s contrasting experiences. They also draw implications for developing countries’ readiness to access monies from the Green Climate Fund. The Green Climate Fund, which is due to become operational next year, is intended to offer far greater volumes of climate finance to developing countries. Different types of organisation can become National Implementing Entities (NIEs) in order to access money from the Adaptation Fund (AF). NIEs in both Jamaica and Senegal have faced common challenges in managing large sums of money and meeting the fiduciary standards of the AF. Including civil society early in the NIE accreditation process is beneficial for later phases of project implementation. 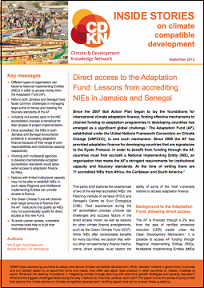 Once accredited, the NIEs in both Jamaica and Senegal encountered problems in accessing adaptation finance because of their range of core responsibilities and institutional capacity, respectively. Working with multilateral agencies to develop internationally-accepted accreditation standards would allow wider access to adaptation finance for NIEs. Nations with limited institutional capacity may not be able to establish NIEs; in such cases Regional and Multilateral Implementing Entities can provide access to finance. The Green Climate Fund will channel even larger amounts of finance than the AF. Institutions that qualify as NIEs may not automatically qualify for direct access to this new Fund. To avoid uneven access, vulnerable countries need help to build their institutional capacity. To read the full text of the ‘inside story’, see below or click on the pdf at right of the image above. Since the 2007 Bali Action Plan began to lay the foundations for international climate adaptation finance, finding effective mechanisms to channel funding to adaptation programmes in developing countries has emerged as a significant global challenge. The Adaptation Fund (AF), established under the United Nations Framework Convention on Climate Change (UNFCCC) is one such mechanism. Since 2009 the AF has provided adaptation finance for developing countries that are signatories to the Kyoto Protocol. In order to benefit from funding through the AF, countries must first accredit a National Implementing Entity (NIE), an organisation that meets the AF’s stringent requirements for institutional capacity and fiduciary standards. At the time of writing there are 11 accredited NIEs from Africa, the Caribbean and South America. This policy brief explores the experiences of two of the earliest accredited NIEs: the Planning Institute of Jamaica (PIOJ) and Senegal’s Centre de Suivi Écologique (CSE). Their experiences during the AF accreditation process uncover key challenges and success factors in the direct access model, as well as lessons for other climate finance arrangements, such as the Green Climate Fund (GCF). While NIEs offer considerable benefits for many countries, we caution that, without other complimentary finance mechanisms, direct access could restrict the ability of some of the most vulnerable nations to access adaptation finance. The AF is financed through a 2% levy from the sale of certified emissions reduction (CER) credits under the Clean Development Mechanism. It is possible to access AF funding through Regional Implementing Entities (RIEs), Multilateral Implementing Entities (MIEs) and National Implementing Entities (NIEs). The significant distinguishing feature of accessing the AF through an NIE, compared with other mechanisms for delivering climate finance, is that it allows countries direct access to development finance through national institutions. While RIEs (e.g. West African Development Bank) and MIEs (e.g. World Bank, UN agencies and bilateral development agencies) may be the best option for some countries – in particular those unable to immediately meet the fiduciary standards of the Adaptation Fund Board (AFB) – they do not provide direct access. The direct access mechanism allows countries to apply to the fund directly through a nominated national organisation (an NIE), thus increasing national ownership of adaptation projects and programmes. The AF and its advocates claim that cutting out intermediaries will ‘help ensure proper reliance on and harmonization with national systems, plans and priorities; can help increase the speed of delivery of desired outcomes; cut transaction costs by ‘domesticating’ core activities; and potentially achieve better targeting of local priorities’. Governments can nominate any national organisation for NIE accreditation as long as it meets the standards, and follows the AFB’s step-by-step accreditation processes. To ensure that adaptation finance provided through the AF is used appropriately and effectively, organisations wishing to be accredited as NIEs must be approved by the AFB and must be able to show that they meet the fiduciary standards laid out by the AF (see Box 1). competency to manage or oversee project execution. During the 9th Meeting of the AFB in March 2010, the CSE became the very first NIE to be accredited globally. The Senegalese institution is an association that is subordinate to the Ministry of the Environment and Environmental Protection. While it is closely affiliated to the government, it is not a state body but is a multi-stakeholder organisation receiving funding from the United Nations Development Programme (UNDP) and the private sector. According to Adiave Cheikh Sylla, Director of Environment for the Ministry of Environment and Conservation, the legal status of the CSE – as separate from the institutions of the state – was a crucial factor for its nomination by the National Climate Change Committee (NCCC): ‘We made an explicit effort to nominate a NIE that was not part of the State in order to prevent any potential conflicts of interest when managing Adaptation Fund financing’. The CSE was selected as the NIE because it had transparent management systems, a satisfactory level of existing funds, a project management infrastructure, and the capacity to manage relatively large projects and programmes. After the AF’s Accreditation Panel reviewed the documentation submitted by the CSE, it held a site visit in Senegal. The Panel decided to recommend the accreditation of the CSE, ‘provided that the AFB exercised additional due diligence if the CSE were to administer projects larger than US$1 million, and provided that the Board consider requesting more frequent reporting for projects that were either supervised or executed by the CSE’. Since the CSE was accredited as an NIE, the AF has approved US$8,619,000 of funding for the project ‘Adapting to coastal erosion in vulnerable areas’. The project was approved on the 17th of September 2010, just 6 months after the CSE was formally accredited as an NIE. The 2-year project started in January 2011 and to date has received $US 4,690,000.
early inclusion of civil society. Senegal stands out in comparison to other NIE-accredited countries in the way it included civil society in the decision-making process from the very beginning. This entailed opening early-stage meetings to non-government organisations and community service organisations and involving stakeholders at all levels. The relationships established at this stage were useful for making later decisions about adaptation projects. Amadou Dieye, Technical Director of the CSE, explained that the organisation has gone beyond its mandate by conducting stakeholder consultations all along the coast to inform its coastal protection project. the NIE governance structure. Oversight from all levels of stakeholders involved was very important to both the NCCC and CSE when designing the governance structure of the NIE. Steering Committees have been set up at project, regional and national levels. These Committees are responsible for validating quarterly reports, and provide recommendations when necessary before they are submitted to the AFB. continuity at climate negotiations. Senegal has been involved in the climate change arena since the early 1990s and has benefitted from relative political stability over the years. Adiave Cheikh Sylla also explained that ‘every Senegalese delegation … requires at least two delegates that have participated at the previous event.’ This has reinforced a culture of continuity and sustainability in the implementation of climate change projects and programmes. existing reputation. The NIE developed a certain level of transparency even before being nominated for accreditation. The benefit from this is that it has been able to attract new donors because of its reputation for financial responsibility. There were initial concerns from decision-makers in the NCCC over whether the CSE could manage a budget 2–3 times the size its usual budget. To improve its absorptive capacity, the CSE revised its relevant policies and procedures; for example, with regards to procurement it commissioned experts to recommend changes in existing systems. They also included additional safeguards to prevent fraud and corruption. It is crucial to find the right balance between having good rapport with the implementing partners, while maintaining a respectable distance as the ‘funding entity’ by setting up rigorous monitoring systems. Managing expectations has been a challenge for the CSE and NCCC. Some donors and project beneficiaries perceive the CSE to be directly involved in project implementation. However, the CSE is responsible only for helping with decisions on the appropriateness of potential projects, making formal applications to the AFB, and channelling the funds to implementing organisations. Human resource management is critical to running the NIE, particularly when setting up the systems and identifying capacity gaps early on. CSE has created a separate office for this NIE-related work. CSE has created a pool of experts that help inform decisions about which adaptation projects should be prioritised, and ensure that adaptation options can be weighed effectively, improving the quality of project finance applications to the AFB. The direct access mechanism developed strong national ownership of adaptation finance and has helped improve Senegal’s institutional capacity. Other organisations, such as the ‘Institut Sénégalaise de Recherche Agricole’ are in the process of improving their accounting practices and transparency after seeing the benefits for the CSE. Like Senegal, Jamaica was one of the first countries to apply for NIE accreditation. The PIOJ was officially accredited in September 2010. Indi Mclymont-Lafayette, Regional Director of Community, Media and Environment at PANOS Caribbean, explained that Jamaican officials were made aware of the possibility of NIE accreditation through their UNFCCC focal point, noting that the foresight in recognising the opportunity was a major factor in the eventual accreditation of the PIOJ as an NIE. Raising awareness of the Fund at the country level has been a priority for the AF’s Accreditation Panel, which explicitly acknowledged that a lack of awareness was a barrier for some countries. The PIOJ is Jamaica’s national planning institute, and is responsible for the country’s long-term strategy laid out in Jamaica’s National Development Plan, Vision 2030. Established over 50 years ago, the PIOJ is a government agency and has a broad remit for planning strategy. It is responsible for coordinating development policies and implementing programmes for Jamaica’s economic, social and environmental development, as well as undertaking research on issues of national development. The PIOJ is also a government mediator that collaborates with international development partners and has a great deal of experience in accessing and channelling development finance. Since the PIOJ was accredited as an NIE, it has had one project approved by the AFB. Still in its early stages, the project ‘Enhancing the Resilience of the Agricultural Sector and Coastal Areas to Protect Livelihoods and Improve Food Security’ has been granted US$9,965,000 for delivery. The project was approved on the 28th of June 2012, 21 months after the PIOJ was first accredited as an NIE. The fact that climate adaptation is not the PIOJ’s sole focus may have been a contributing factor to the length of time in attaining project approval. maturity as an organisation. The PIOJ has existed in its current form since the Planning Institute of Jamaica Act 1984 and for more than 50 years as the national planning office. established institutional arrangements. The PIOJ is governed by the Planning Institute of Jamaica Act 1984 and the Financial Audit Act. The organisation was able to provide past project summaries, annual reports dating back several years, auditor’s reports and detailed financial statements. close ties to government and development institutions. The PIOJ acts as the government mediator with development partners and is responsible for all project cycle management and auditing associated with the government’s public sector investment programme. experience in obtaining development finance and managing projects. The PIOJ acts as the national authorising office for cooperation with the EU. It executes UNDP programmes and implements cooperation initiatives through multilateral development partners. It channelled US$1.2 billion of international development finance from a range of donors in 2009, demonstrating that many of the institutional arrangements needed for NIE accreditation were already in place. responsibility for planning over the long term and across a range of sectors. The organisation manages the National Development Strategy for Jamaica: Vision 2030. The PIOJ’s core competencies also include economic planning, environmental sustainability, social policy and sustainable development. Despite a generally smooth accreditation experience, Hopeton Peterson – the PIOJ’s Manager of Sustainable Development and Regional Planning – recalled that the PIOJ was surprised by the extent of required supporting documentation. After the PIOJ’s initial application, the AF Accreditation Panel requested that it provide further evidence regarding the project-cycle management: ‘their concern was that although we had been playing a role in project-cycle management all of these years, there was insufficient documentation of project management internally.’ The PIOJ then had to formalise its project management processes and produce a handbook detailing the procedures to be followed. Another important challenge for the PIOJ has been in accessing project finance. A proposed project on food security in coastal areas has been granted US$30,000 for concept development, but the PIOJ has yet to receive the actual project funding, expected to total around US$10 million. Sven Harmeling, International Climate Policy Team Leader at Germanwatch, suggested that this might be a reflection of the fact that PIOJ is responsible for a large number of development planning projects and therefore cannot focus all of its energy on climate adaptation. The AFB requires a significant amount of supporting documentation. Documentary evidence of procedures that stretched back a number of years was required for the application. Direct access can be an effective channel. Since it can apply for finance directly, the PIOJ has benefitted from increased ownership of the adaptation process and reduced levels of bureaucracy. NIE accreditation improves institutional capacity and reputation. The PIOJ has been strengthened by the accreditation process, which has allowed it to revisit and tighten up its project management processes. Mr Peterson remarked that accessing finance from other sources is now easier. ability to demonstrate significant levels of institutional capacity. Trust was key for accreditation in both cases. The PIOJ had a long history of handling large amounts of development finance and had sufficient credibility to engender trust. As for the CSE, its legal status gave it a level of impartiality. This shows that while certain characteristics support NIE accreditation, there is no ‘one-size-fits-all’ solution – the chosen organisation must be appropriate for the social and political context of the applicant country. Both the CSE and the PIOJ were exceptionally well-placed to meet the fiduciary requirements of the AF, perhaps explaining why they were two of the first organisations to pass successfully through the process. The sharp reduction in the number of other organisations being accredited in the following 12 months might suggest that these two are atypical in terms of capacity and institutional arrangements. Both organisations also faced challenges in accessing the finance after they were accredited. Although the PIOJ’s breadth of core responsibilities was an asset during the accreditation process; it may have been a contributory factor in the long time taken for it to access its first slice of funding. Conversely, the CSE’s focus on adaptation allowed it to mobilise funds more rapidly, but its smaller size meant that it was granted large-level funding (more than 1 million US$) only on condition of more stringent reporting. The AF accreditation panel has taken action to clarify the accreditation process. At the Third Meeting of the AF accreditation panel in 2010, it was recognised that there were several barriers to accreditation, after a large number of sub-standard applications were received and rejected. These barriers included language issues, confusion about the amount and type of supporting documentation that was needed, and a lack of clarity regarding the application process. This led many countries to protest that the standards were too stringent. Wary of watering down the fiduciary standards, the AF panel instead created the ‘Adaptation Fund NIE Accreditation Toolkit’ to clarify the process. This includes a detailed manual with case studies and examples of documentary evidence, along with an online step-by-step guide available in six languages. These measures have significantly improved the quality of subsequent applications. Overall the CSE and PIOJ have found the experience of being accredited as an NIE to be extremely beneficial. However, it was suggested that it would be far more effective if it the accreditation process could be coordinated with other agencies that deliver development finance. Even though the PIOJ and the CSE are accredited NIEs that have met the AF’s tough fiduciary requirements, they should also work with other international, regional and multilateral agencies to develop an internationally accepted accreditation standard for climate finance. This would enable them to mobilise adaptation funds more quickly. The GCF will likely channel much larger amounts of adaptation finance. Therefore, it cannot be assumed that organisations that are currently accredited as NIEs will be automatically suitable to act as implementing entities under the GCF. The CSE, for example, had initially been limited to funding of less than US$1 million and required special dispensation for its US$8.4 million AF project grant. For direct access to work under the GCF, there would need to be a concerted effort to build institutional capacity among the most vulnerable nations – or more safeguards would need to be introduced. There was concern that the advantages of direct access are only available to those countries with established institutions. Such nations, particularly in Africa and among some Small Island Developing States, have a high proportion of vulnerable people and, typically, low levels of institutional capacity. Accessing finance through an NIE favours those nations with established institutions that have developed existing relationships with international donors and development organisations, as well as an existing track record in delivering development programmes. The scale of finance offered through the GCF would likely magnify these inequalities. Image on 'Inside Story' courtesy of Oxfam International. Huq N. (2011) ‘Financing adaptation: For whom, by whom, and how’, in W.L. Filho (ed.) The economics, social and political elements of climate change. Berlin and Heidelberg: Springer-Verlag. Indy Mclymont-Lafayette, Panos Caribbean. Personal interview. 7 June 2012. Adaptation Fund Board (2010) Report of the third meeting of the Accreditation Panel.AFB/B.11/4, Agenda item 5. Hopeton Peterson, PIOJ. Personal interview. 13 June 2012. Sven Harmeling, Germanwatch. Personal interview. 20 June 2012. Senior communications consultant at Acclimatise Ltd. This study aims to offer guidance to governments and their partners on how to engage the private sector in the NAP process. This paper shows how institutions can strengthen their capabilities to tackle climate change across different levels of government. Senegal’s NAP process has created institutional mechanisms that facilitate strategic linkages between local and national adaptation planning in climate-sensitive sectors. This short brief aims to enhance awareness and highlight the importance of integrating weather and climate-related risk into the planning stages of energy infrastructure development. The brief highlights a selection of communications activities and best practices that the Government of Saint Lucia has undertaken to raise awareness of the need to adapt to climate change. The IPCC’s 1.5°C Report – What are the implications for development choices in Latin America? Blog: Maria Jose Pacha says that the IPCC's 1.5C Report implies far more integrated public policy-making in Latin America that takes account of food, energy, water and climate securities at once.